Ocean levels rose 50 percent faster in 2014 than in 1993, with meltwater from the Greenland ice sheet now supplying 25 percent of total sea level increase compared with just 5 percent 20 years earlier, researchers reported Monday. The findings add to growing concern among scientists that the global watermark is climbing more rapidly than forecast only a few years ago, with potentially devastating consequences. Hundreds of millions of people around the world live in low-lying deltas that are vulnerable, especially when rising seas are combined with land sinking due to depleted water tables, or a lack of ground-forming silt held back by dams. Major coastal cities are also threatened, while some small island states are already laying plans for the day their drowning nations will no longer be livable. “This result is important because the Intergovernmental Panel on Climate Change (IPCC)” — the U.N. science advisory body — “makes a very conservative projection of total sea level rise by the end of the century,” at 60 to 90 cm (24 to 35 inches), said Peter Wadhams, a professor of ocean physics at the University of Oxford who did not take part in the research. That estimate, he added, assumes that the rate at which ocean levels rise will remain constant. Greenland alone contains enough frozen water to lift oceans by about 7 meters (23 feet), though experts disagree on the global warming threshold for irreversible melting, and how long that would take once set in motion. “Most scientists now expect total rise to be well over a meter by the end of the century,” Wadhams said. 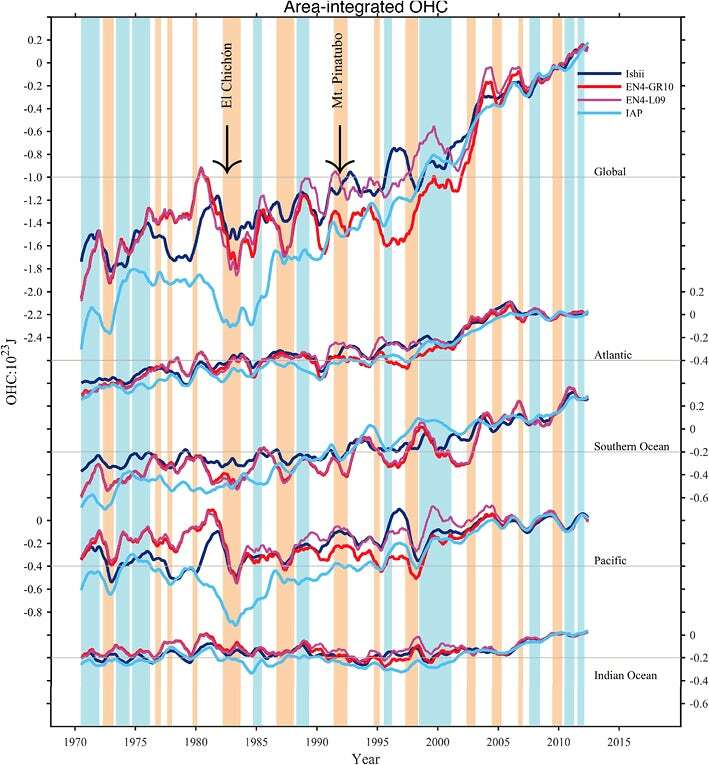 The new study, published in Nature Climate Change, reconciles for the first time two distinct measurements of sea level rise. The first looked one-by-one at three contributions: ocean expansion due to warming, changes in the amount of water stored on land, and loss of land-based ice from glaciers and ice sheets in Greenland and Antarctica. The second was from satellite altimetry, which gauges heights on the Earth’s surface from space. The technique measures the time taken by a radar pulse to travel from a satellite antenna to the surface, and then back to a satellite receiver. Up to now, altimetry data showed little change in sea levels over the last two decades, even if other measurements left little doubt that oceans were measurably deepening. “We corrected for a small but significant bias in the first decade of the satellite record,” co-author Xuebin Zhang, a professor at Qingdao National Laboratory of Marine Science and Technology in China’s Shandong Province, told AFP. Overall, the pace of global average sea level rise went up from about 2.2 mm a year in 1993, to 3.3 mm a year two decades later. In the early 1990s, they found, thermal expansion accounted for fully half of the added millimeters. Two decades later, that figure was only 30 percent. Andrew Shepherd, director of the Centre for Polar Observation and Modelling at the University of Leeds in England, urged caution in interpreting the results. “Even with decades of measurements, it is hard to be sure whether there has been a steady acceleration in the rate of global sea level rise during the satellite era because the change is so small,” he said. Disentangling single sources — such as the massive chunk of ice atop Greenland — is even harder. But other researchers said the study should sound an alarm. “This is a major warning about the dangers of a sea level rise that will continue for many centuries, even after global warming is stopped,” said Brian Hoskins, chair of the Grantham Institute at Imperial College London. Your home may be your refuge in Hong Kong, but not from air pollution. It’s probably worse. Exposure to PM2.5 particulates small enough to lodge deep in the lungs and most harmful to human health have been found to be just as high – or higher – inside people’s homes as they are outdoors or during the commute to work on an average weekday. A two-year study by think tank Civic Exchange and City University, funded by investment bank Morgan Stanley, found that most urban dwellers are exposed to concentrations of PM2.5 during their daily commute that are almost always above average limits set by the World Health Organisation, and generally above readings at the nearest air quality monitoring station. While the Environmental Protection Department’s 16 stations can monitor and assess ambient and roadside air quality across districts, the study fills a relatively wide gap in statistics on individual-level exposure to pollution in different “micro-environments”. Co-author Dr Zhi Ning reported finding that people were exposed to air pollution risks not just outdoors but also indoors at home or the office. The researchers employed 73 volunteers who carried lunchbox-sized “personal exposure kits” fitted with sensors and GPS, 24 hours a day for a year around the city. They found that most spent more than 85 per cent of each weekday indoors, which broke down to 42 per cent of the day at home, 34 per cent in the office, 4 per cent commuting and 11 per cent outdoors or in other indoor areas. Homes were found to contribute 52 per cent of an individual’s personal exposure to PM2.5 compared with 13 per cent for offices, 4 per cent while commuting, 18 per cent outdoors and 14 per cent in other indoor areas. The average PM2.5 concentration measured in homes – 42.5 micrograms per cubic metre – was three to four times lower than outdoors but slightly higher than while commuting and three times higher than in the office. Factors for the PM2.5 build up in homes, Ning surmised, could range from cooking and the type of gas used to proximity to a construction site or smoking tobacco. And this was exacerbated by poor ventilation and dirty air filters. Offices tended to have better ventilation systems. Flats on lower floors were also exposed to more pollution. But Ning found little correlation between personal exposure and district pollution. A person who spent more time in better ventilated indoor areas in heavily polluted Sham Shui Po, for example, could have a lower exposure to PM2.5 than the station reading and vice versa. “Right now we only rely on [the department’s] data but they only provide a general, ballpark figure,” Civic Exchange research fellow and co-author Simon Ng Ka-wing said. The study recommended the government do more to promote better indoor air quality in homes and implement a comprehensive management programme. Speaking on sidelines of three-day World Sustainable Built Environment Conference in Hong Kong, Christiana Figueres insisted the global shift towards reducing carbon emissions would not be shaken. The United Nations’ former climate chief has struck a defiant note against US President Donald Trump ’s pullout from the landmark Paris accord, insisting the global shift towards reducing carbon emissions will not be shaken. In an interview with the Post, Christiana Figueres, who formerly headed the UN Framework Convention on Climate Change, even “thanked” Trump for effectively reinvigorating the discussion over global warming and making it headline news again. But she admitted it was sad to see the US give up its leading role. She was speaking on the sidelines of the three-day World Sustainable Built Environment Conference in Hong Kong on Monday, the city’s largest ever conference on sustainable buildings and urban development. Tackling climate change  in the face of rapid urbanisation is the key theme. Trump’s politically-motivated gesture, Figueres said, would have limited impact on America, given that more than 175 US mayors, a growing number of states and more than 1,000 corporations had pledged to continue upholding commitments to the Paris Agreement. Figueres brushed off Trump’s announcement as one riddled with inaccuracies, not least because there was no legal basis for it – no country can withdraw from the accord until three years after ratification – and his claims of bringing back coal industry jobs. “It is not feasible and Mr Trump knows it,” she said, adding that most coal jobs had already been killed by cheap natural gas as a result of the recent shale revolution, and mining jobs had been taken over by mechanisation and automation. “It will be increasingly difficult for other heads of state to take Mr Trump seriously,” she added, suggesting that Trump had undermined his country’s credibility. Figueres said it would be inevitable that China – the world’s biggest carbon emitter – continued the charge as its leaders recognised decarbonisation was “good for their economy”. Figueres, who now vice-chairs the Covenant of Mayors for Climate and Energy, said built-up environments contributed to one-fifth of global emissions. The conference was being held in Hong Kong as it was a gateway to Asia, she said. To understand why President Donald Trump pulled the United States out of the global Paris climate agreement, we might start by looking at the sources he relied on to justify his decision. But we’re not going to start there, but we will end there. Instead, let’s go back to the early 1990s. The tobacco industry was facing multiple bans on advertising its products in countries around the world. So the tobacco industry took ownership of a study that reviewed a bunch of other studies about the claimed impacts of tobacco advertising on actual tobacco consumption. In short, the study, handed to Phillip Morris International, concluded there was no real link between tobacco advertising and smoking levels. Studies that had found a link were probably flawed, the report claimed. The reports, the letters, and the memos back and forth, are all buried away in the Tobacco Industry Documents Archive at the University of California – San Francisco. Clearly, the report would help the tobacco industry to argue there was no need to regulate the advertising of its products, because that advertising didn’t make a difference to smoking levels one way or the other. The company that carried out that tobacco study was National Economic Research Associates. Why is this relevant to Donald Trump and his decision to pull out of the Paris climate agreement? When Trump spoke of the “onerous energy restrictions” he claimed the Paris deal placed on the United States, he cited figures from a report by the very same National Economic Research Associates (NERA). According to the NERA study, the Paris agreement would cut coal and gas production, and “cost” America 2.7 million jobs. Two groups, namely the American Council for Capital Formation (ACCF) and the U.S Chamber of Commerce, sponsored the NERA report (incidentally, a New York Times investigation described the chamber as Big Tobacco’s Staunch Friend in Washington, due to its advocacy for the industry). NERA has also produced reports supporting the LNG industry and the coal industry. The ACCF has, over the years, accepted funds from a string of major corporations and industry groups, including ExxonMobil, the American Petroleum Institute and foundations linked to the billionaire petrochemical brothers Charles and David Koch. “The study makes worst-case assumptions that may inflate the cost of meeting U.S. targets under the Paris accord while largely ignoring the economic benefits to U.S. businesses from building and operating renewable energy projects. A separate team of economists and scientists has also checked the claims made in the NERA report, which has previously been cited by failed Republican Presidential candidate (and climate science denier) Ted Cruz. They come to similarly unflattering conclusions to the AP fact check. So in the end, we have President Trump relying on a questionable report paid for by groups with a clear vested interest in undermining the Paris agreement. When reporters were being briefed in the hours before Trump walked out to the White House Rose Garden, it was Trump’s energy aide Mike Catanzaro making the calls. As DeSmog’s Steve Horn has pointed out, Catanzaro is a former fossil fuel and energy lobbyist with a history of attacking climate science. He also spent time working with Senator James Inhofe – the Republican who claims global warming is the greatest hoax ever. Catanzaro is just one of a parade of former industry lobbyists now in top positions in the Trump administration. The Paris climate deal, struck in late 2015, was rightly declared a historic moment. No doubt too, Trump’s declaration that he will join Nicaragua and Syria outside the deal will also be seen as historic. It was a decision to delay action to regulate an industry, based on tired old propaganda techniques and the self-serving analysis of a polluting industry under attack.